How do I schedule a tasting? Simply click the schedule now button at the top of the page, or visit our contact us page to call, or send us an email; and we will contact you to schedule a tasting at our cake studio in Delray Beach. What is involved in the tasting process? Our onsite tasting and consultations include everything you will need to begin your design process. 1. Allow a minimum of one hour. Sugar Chef staff will personally attend every consultation with hand-selected samples and designs suited for your occasion. 2. Do your research! Take a little time to think about what you would like for your perfect wedding or special occasion cake. Take a look at our Gallery and on other websites and publications to get ideas for your theme, colors, etc. Bring them along to our meeting so that we can discuss the elements that will encompass your perfect cake. 3. Bring all decision makers! Whether it is your fiancé, mother, maid of honor, children, neighbor, or coworker, make sure you have your sounding board with you. Otherwise you may find that you want the opinion(s) of people who are not in attendance, which can potentially hamper decisions that are made at the consultation. Besides, the experience is more fun when you can share it with your important people. 4. Pick your flavors! Two complimentary cake and filling flavors of your choice are provided. Additional flavors are available for $5 each. 5. Think you’re ready to make a deposit? Bring your checkbook. Sugar Chef creates only a limited number of wedding cakes each week, and a 50% nonrefundable deposit will reserve your date. Does Sugar Chef ship cakes? Due to the delicate nature of wedding cakes and fillings, as well as intricate craftsmanship dedicated to every special occasion cake, Sugar Chef creations are available only via hand-delivery. Can I visit the bakery? We would love for you to visit our bakery/studio! We hold all of our consultations at our bakery/studio in Delray Beach, so if you are coming to see us for a consultation, you will see the bakery at that time. We see all clients by appointment, and if you would like to schedule an appointment for a consultation, you can do so by clicking on the “schedule now” button at the top of our webpage, or if you prefer to call us, you can do so at any time. We are available for visits by appointment only, so please contact us in advance to be sure we will be available. How long is the tasting and consultation appointment? That question depends a lot on the client. We find most consultations to take 30-45 minutes, but we do allow time for up to one hour if needed. If you are in a hurry, you can make for a shorter consultation if you review our galleries, or other galleries, and bring in any design inspirations that you may have. Additionally, if you are really in a hurry, you can email us any links or pictures that depict elements of your desired design prior to your appointment, and we will try to have a sketch ready for your consultation. We will make every effort to have your design completed by the end of our appointment, but if you would like revisions made, we are able to scan and email any design changes that occur prior to your event date. Lastly, to save more time, be sure to review our pricing pages, this FAQ page, the flavor menu and our cake contract which should answer many of the questions that you may have prior to our appointment. Why do Sugar Chef creations cost more than some other bakeries? Why do some cars cost more than others, or some clothes cost more than others? While we do make every effort to work within every budget, we don’t make any claim to be the least expensive bakery, nor the most expensive either. In fact we are very proud of the quality of our ingredients, and our famous attention to detail that we give every cake big and small. Every Sugar Chef cake is hand-crafted specifically for the client, not picked out from a catalog or made from a stencil, never frozen, and can take upwards of 30 hours to create. When a plain ice cream cone can cost $3-5.00, we consider our pricing to be competitive and representative of the work involved. Sugar Chef uses only the finest ingredients, as well as time-honed techniques perfected over nearly two decades of creating wedding and other gourmet cakes. Sugar Chef’s goal is to achieve the best value for every client by over-delivering on the promise of a customized masterpiece for their special event. See our pricing. Can you work within dietary restrictions/food allergies? Absolutely! The Chef will review applicable restrictions during your design consultation, and determine the perfect recipe substitutions prior to order. We are also proficient in the production of Vegan Cakes. We can also do gluten free and sugar-free. Can I provide my own personal recipe? The Chef will review all requests prior to or during a tasting and consultation; however, it is unlikely that we can duplicate a recipe exactly due to scaling and ingredient differences. Can you use fresh flowers to coordinate with my display? Yes! 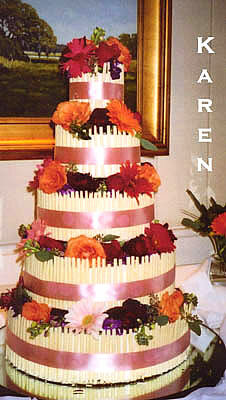 Your florist will be accustomed to providing extra flowers upon request to decorate your cake display. Note that some florists may include an additional charge for the decorative flowers. Sugar Chef requires a 50% non-refundable deposit at the time an event date is secured. In the event of cancellation, Sugar Chef will apply the deposit payment toward a rescheduled event within six months of the original date. Due to the custom nature of Sugar Chef’s creations, we schedule a limited number of events each year. Any events cancelled within 30 days of the event, and not rescheduled with us, will incur a cancellation penalty in addition to the deposit. Our complete policies can be found here. Credit cards may be used through PayPal for some of our birthday and occasion cakes. Deposits on wedding cakes are cash or check only due to their nature and cost. If you must pay with a credit card, please contact us to discuss. Can you recreate a cake by another bakery or designer? Inspiration for cakes comes from many different places, and Sugar Chef is happy to design from sketches, magazine clippings, books or any other source. Can you create adult-themed cakes? Yes! Sugar Chef can create cakes to complement every event theme, whether formal, casual fun or something in-between. Sports cakes, naughty cakes, tech cakes, fashion cakes and the like can be found here. Does the complexity of the design affect the price? Cake cost is factored by the time required to bring the design to life, so if your design doesn’t match your budget, we can discuss alterations that will still allow you to have a wonderful design within your budget.